The “Accessible” page is a text-based page containing essential information about the content of this portfolio. Ebonye Gussine Wilkins is a writer, editor, and publisher based in New York City. With a love for reading and writing, a background in linguistics, professional training as an editor, and a dedication to social justice, she enjoys helping people find better ways to say what they mean and get a well-crafted message to the intended audience. Ebonye earned degrees from Johns Hopkins University and the CUNY School of Professional Studies. She received a professional certificate in editing from UC Berkeley Extension. Her work includes editorial support for individuals, non-profits, and government agencies. 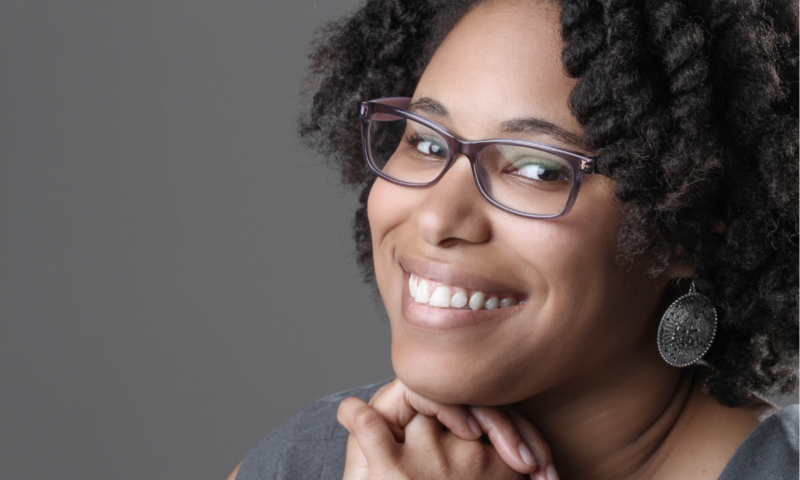 Ebonye founded August Rose Press in 2013, and has published one work of fiction. Her nonfiction work has appeared in the YES! Magazine, Refinery29, Blavity, East Bay Express, and IBPA’s Independent magazine. She lives in New York City. Description: A feature article covering the issues facing women of color in STEM-related fields, including matters of recruitment, retention, and career goals. Publication: Haas Institute Newsletter, Fall 2015. Full Text. Description: A feature article acknowledging the twenty-fifth anniversary of the Americans with Disabilities Act. It includes a list of ways to make content and events more accessible for more persons with disabilities. Publication: Haas Institute Newsletter, Spring 2015. Full Text. Description: A feature article explaining to independent publishers about three ways they can help account for their readers when producing books. Publication: IBPA’s Independent Magazine, January 2017. View Online. Request PDF. Description: A feature article on what indie publishers can do differently to attract new business. Description: A feature article about how to increase the chances of your book winning an award by paying attention to details. Publication: IBPA’s Independent, June 2017. Request PDF. Publication: Haas Institute for a Fair and Inclusive Society, July 2015. View Sample. Full Text. Publication: Haas Institute for a Fair and Inclusive Society, September 2015. View Sample. Full Text. Publication: Haas Institute for a Fair and Inclusive Society, May 2016. View Sample. Full Text. Publication: Haas Institute for a Fair and Inclusive Society, March 2017. View Sample. Full Text. Publication: Haas Institute for a Fair and Inclusive Society, January, 2016. View Sample. Full Text. Description: A compilation of six summaries of publications from the Haas Institute. Publication: Haas Institute for a Fair and Inclusive Society, May 2016. Description: A summary of past events and content compilation. Publication: Haas Institute for a Fair and Inclusive Society, Spring 2015. Description: A summary of four publications. Publication: Haas Institute for a Fair and Inclusive Society, Fall 2015. Description: A post-conference report of the Haas Institute’s first national conference on inclusion and belonging. Publication: Haas Institute for a Fair and Inclusive Society, Summer 2015. View Archived Report. Description: A semi-annual newsletter featuring updates, past publication information, feature articles and notable events from the Haas Institute. Publication: This is not public document. Request PDF. Description: The first editorial style guide created exclusively for the the Office of Equity and Access, New York City Department of Education. Description: An evaluation of why full funding of public pensions may not be practical for municipalities. Publication: Haas Institute for a Fair and Inclusive Society, February 2017. View Sample. Full Text. Description: A research report on how the US Farm Bill’s helps reinforce systemic inequities and how it can change to produce more equitable outcomes. Publication: Haas Institute for a Fair and Inclusive Society, October 2016. View Sample. Full Text. Description: The companion guide that summarizes the US Farm Bill report by the Haas Institute. Publication: Haas Institute for a Fair and Inclusive Society, November 2015. View Sample. Full text. Description: A how-to manual to help create a racial equity action plan in local government agencies while still involving the constituents within its jurisdiction. Publication: Haas Institute for a Fair and Inclusive Society, December 2016. View Sample. Full Text. Description: An analysis of the true cost of issuing municipal bonds and how those expenses can be reeled in without austere measures. Description: A research report measuring inclusion in countries around the world using data that does not directly draw on GDP. Publication: Haas Institute for a Fair and Inclusive Society, September 2016. View Sample. Full Text. Publication: IBPA Independent Magazine, January 2016. Request PDF.